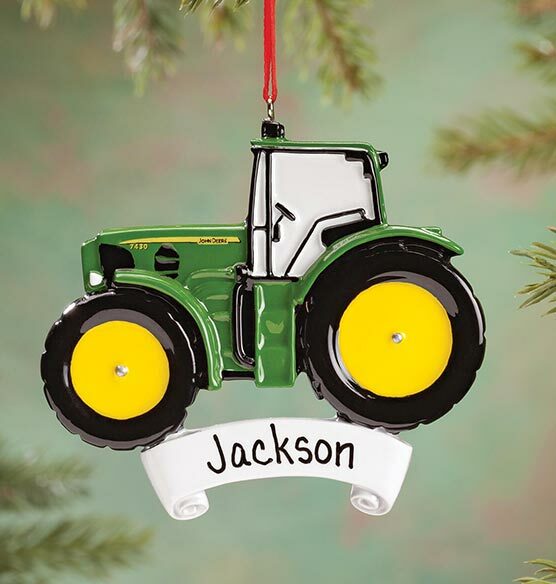 Adding the right shade of "green" to any Christmas tree, this Personalized John Deere® Tractor Ornament will have tractor fans smiling brightly. The nostalgic Christmas ornament is wonderfully detailed in resin with authentic details collectors of all ages will love. We'll add any name to the white banner for a keepsake treasure (because nothing lends cheer like one's very own Deere!). Specify name; limit 1 line, 12 letters/spaces. Resin. 3 1/2" wide x 3 1/4" high. Ornament was perfect. Grandson loved it. Loves tractors and a plus with his name.